Summary: An analysis of yogurt consumption among Italian consumers, done as part of a large European diet and cancer risk study, showed that those who eat yogurt at least once per day have a significantly lower risk of colorectal cancer than those who eat none. 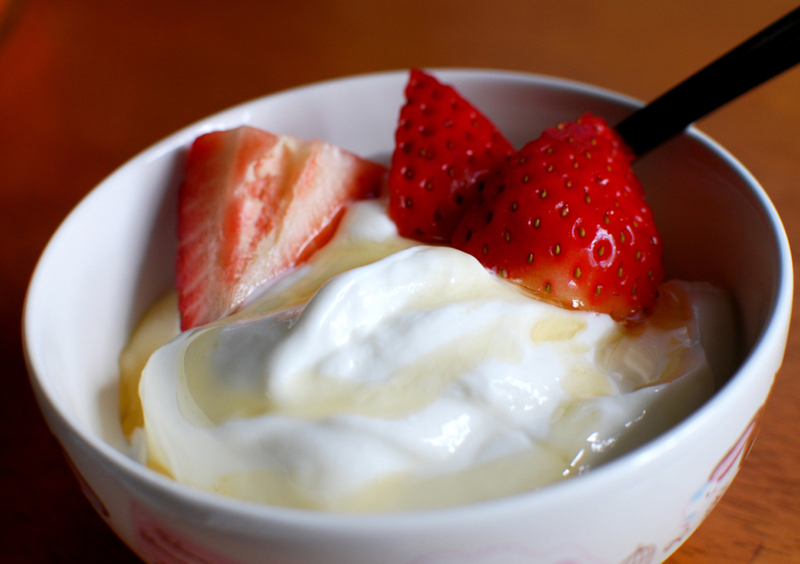 Yogurt and other fermented milk products are rich in lactic acid and vitamin K2. The latter has been shown to inhibit the growth of tumor blood vessels (angiogenesis), a critical step in cancer development and progression. The effect was more pronounced in men than in women. The study results add to the body of evidence that fermented dairy products and vitamin K2 have anti-cancer properties and should be included as part of a healthy diet. Colorectal cancer (CRC) is one of the most common, yet preventable cancer types. It has been estimated that over 70% of CRC cases in men could be preventable by a combination of dietary and lifestyle changes. Substances presented in fermented milk products like yogurt have long been thought to have a protective effect against CRC. Studies have suggested that lactic acid produced by bacteria in yogurt may protect against cancer by reducing inflammation in the colon and by binding to and neutralizing cancer-promoting compounds and enzymes. Yogurt and other fermented milk products also contain vitamin K2 (menaquinone), which has been shown in laboratory studies to be both anti-carcinogenic and antiangiogenic (inhibits the growth of new blood vessels). In one study conducted in rats, vitamin K2 suppressed the development of liver cancer, likely by inhibiting angiogenesis . Other epidemiological studies have shown that consumption of vitamin K2 through supplements or food can decrease cancer risk. Results on the association between yogurt consumption and CRC risk were recently published as part of a large European epidemiological study, the Italian European Prospective Investigation into Cancer and Nutrition Cohort (EPIC-Italy) . The Italian researchers surveyed 14,178 men and 31,063 women on specific dietary habits, including yogurt consumption. During the 12 years of follow-up, 289 study participants (116 men and 173 women) were diagnosed with CRC. Across the entire study group, volunteers who had the highest daily yogurt consumption (with an average of 90 grams or less than half a cup) had a significantly lower risk for developing CRC compared with those who consumed the least yogurt per day (0-1 grams). These results held even after adjusting for other dietary and lifestyle habits. The protective effect was more pronounced in men than in women. It should be noted that the analysis was confined to consumers of whole-fat yogurt, as low-fat yogurt was rarely consumed. The presence of confounding factors, such as the fact that regular yogurt eaters may have a healthier lifestyle in general, are present. However, the results are strengthened by being prospective (forward-looking) rather than a retrospective, and provide strong evidence for the cancer-preventative effect of eating yogurt. 1. Yoshiji H et al. J Hepatol 2005 May;42(5):687-93. 2. Pala V, Sieri S, Berrino F, et al. Yogurt consumption and the risk of colorectal cancer in the Italian European Prospective Investigation into Cancer and Nutrition Cohort. Int J Cancer 2011;129:2712-2719. Food pages for angio foods associated with this article still to come.